For many freshwater anglers, spring means bass fishing. This is completely understandable. Springtime bassin’ is one heck of a way to spend a relaxing day on the water. But there are more than bass in the lakes and ponds, and anglers who focus their spring efforts solely on bass are missing out on one of the most rewarding spring bites there is: bluegill. While they tend to be overlooked, bluegill are aggressive, frisky fighters on ultralight tackle and one of the finest tasting fish you’ll catch. Use a light action rod with light line and a bluegill will feel like a tarpon on the end of your line. Finally, there’s no better time to catch bluegill than spring. You Convinced Me, Now Where Do I Look? 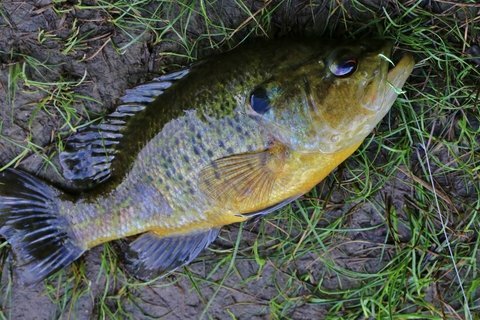 The best places to target spring bluegill are on the outside edges of grass beds, in flooded or submerged timber and around any cover that sits next to the large, sandy flats that bluegill spawn on later in the summer. If you’re not in the mood to spend some time looking for these spots, then find yourself a dock. These structures are magnets for bluegill, as they offer shade from the sun and cover from predators. What Kind of Tackle Do I Use? Honestly, when you’re targeting bluegill, it’s hard to beat a chunk of live bait, such as a nightcrawler, waxworm or a cricket. Thread one onto a gold hook or even a small panfish jig, and you’ll be in good shape. You can also have good luck with small lures, such grubs or even small crankbaits. I Got My Limit. Now What? This is a no-brainer. Clean and eat the dang things! Their small size can make cleaning a lot of ‘gills a tedious job, but you can make it easier and quicker by using an electric knife, like the fan favorite Mister Twister, or even the Tumble Drumm Automatic Fish Scaler. Clean and fillet your bluegill, then fry those delicious, battered cuts for a perfect evening after a day on the water!